Dear Future Self . 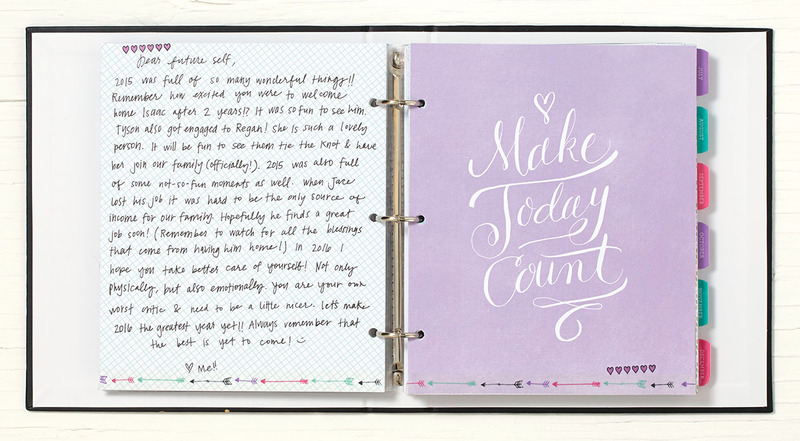 . .
Our My Crush® Everyday Life pages are perfect for this job. Along with encouraging phrases and bold illustrations, the pages also include subtle patterns and colors, making them easy to write on and decorate! So how exactly do you go about writing a letter to yourself? We have a few ideas. Start by jotting down a few lists about yourself—strengths, weaknesses, worries, past successes. Think about your past year and some challenges you’re likely to face this year. Then write your current self a note as if you were a kind and wise mentor trying to encourage a friend. As the year progresses and the hard times hit, you’ll be able to look back and get the help you need from you! Once you’ve finished writing out your letter, feel free to dress it up with a few embellishments—may we recommend the Everyday Life™ Perfect Plan roller stamp and washi tape? They pair wonderfully with the My Crush pages. Then add the page to the front of your planner so you can reference it whenever you need a boost. Your goals are worth working for, and you’re most likely to accomplish them if you have faith in yourself. Preserve that faith with a letter to yourself and shoot for the stars!